"Proletarians of all countries: who washes your socks?" This thunderous slogan accompanied the first rallies of the women's liberation movement in the 1970s. During that period, feminist not only marched for equal rights between men and women, but to also to dismantle prejudices. What is the state of things almost 40 years later? The DSK affair, as well as the exhibition in Paris by the Ukrainian collective Femen, raised the debate on the representation of women and sexism in society. 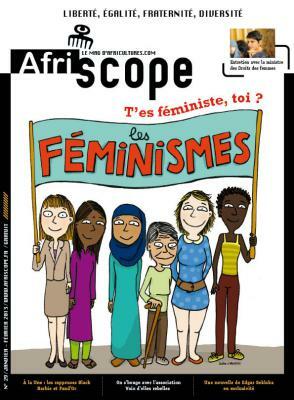 The ministry of the rights of women in France, reestablished in 2012, called for a programme to dismantle prejudices, as statistics indicated continued violence toward women. A new era, but the same struggle? Interested in stimulating reflection in a diverse field of possibilities, Afriscope got feedback from associations that deal with women on a daily basis, as well as talked with artists who circulate in very male-dominated spaces such as rap, at the same time maintaining discussions with spokespeople in institutions. Without concealing the real obstacles nor encouraging a meritocracy which only has merit in principle, Afriscope looked for possible solutions through diverse perspectives and journeys so that universal feelings could emerge. The results show that women's struggle for equality, respect and dignity does not belong to only one social class or one territory. It does not necessarily have a feminist label, it is diverse and multifaceted, always reflecting current attitudes and the state of society. To ask how are women doing is to also ask about men, and to ask how we all are doing? Is this a feminist question? Or is it not simply a humanist one? Rap by women is a "reflection of society"